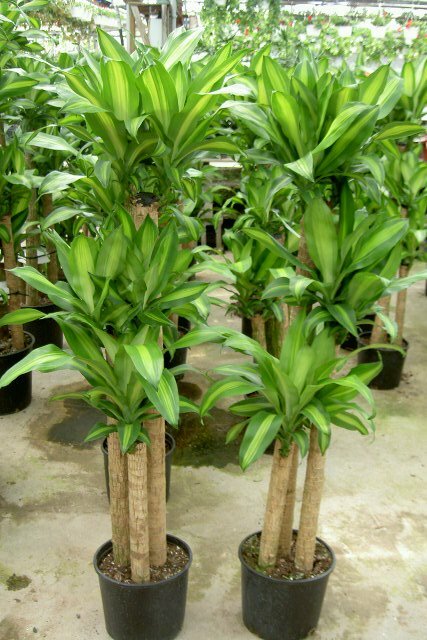 The Corn Plant is one of the most recognized and popular indoor tropical plants, common as a house plant and as a tropical office plant. It is most often sold as a group of 3 or 4 canes of varying heights, each with one or two clusters of leaves at the top of the cane. Occassionally unique bonsai-like ‘stump’ forms are available. The leaves are beautiful; broad and arching, with a prominent cream to yellow stripe down the center. Newer cultivars, such as the ‘Santa Rosa’ have a white stripe. In lower light conditions, the foliage will lose its colourful variegations and revert to solid green. The botanical name refers to the very intense fragrance of the pinkish coloured flowers. In its native habitat of eastern Africa, the plant flowers frequently. It is rare but a pleasant surprise to see flowers on indoor plants, and will most often appear on plants kept in bright locations. The Corn Plant will tolerate a wide range of light intensities, making it an ideal house plant. It requires very little water, and needs to dry out thoroughly between waterings. As with most plants in the Dracaena family, the Corn Plant does best when watered from the bottom. A good sub-irrigation system will allow the plant to take up only the amount of water it needs. Over-watering is the most common problem with these plants and is characterized by droopy yellow leaves with brown or black tips. Because the plant has a very weak root system, disturbing the canes can easily damage the roots. The plant should never be moved by the canes. Because of this sensitivity, this plant is not recommended for commercial public areas where it is at risk of being disturbed. The Corn Plant is resistant to most pests, but occassionally can succumb to mealy bug. Fertilize with a high quality tropical plant fertilizer once per month from the spring through until the late fall.